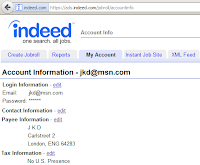 Indeed is a meta search engine a searching tool over Internet which sends requests to other search engines and sum up the results into one list to display according to their sources) for jobs. 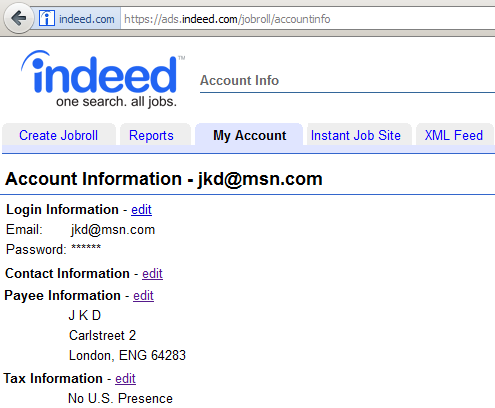 Indeed has introduced an improved approach to job search. On a single search, job seekers now have free access almost instantly to millions of jobs from thousands of company websites, job boards, newspapers and associations. Indeed is a privately held company based in Stamford, Connecticut, USA, founded by Paul Forster and Rony Kahan. For more information, please visit the website. For web publishers or bloggers looking to list niche jobs or job search services on their sites/blogs, Indeed Publisher Program enables webmasters and bloggers to display the Indeed Job advertisements in customized listing that is automatically updated with the latest available jobs from Indeed.com. Revenue generated from clicking on those job ads is shared with publishers, providing a financial incentive to publishers of all kinds to join the program. At the time I am writing this post, I have this blog site opened for 3 months. After doing quite a lot of searching and reading various articles about affiliate programming to monetize blog over Internet, I became sure to go for a monetizing program which has good reputation and easy to build. Also I wanted to have an affiliate program with less strict rules and regulation s (after I got my Google AdSense account banned without any proper reason presented to me by "almighty" Google). Finally, people will see with interests the job advertisements according to their needs more than any random advertisements. After all, everyone of us want to have our dream job and Indeed.com is surely the number 1 in job searching. The choice finally becomes easy for me when I have seen that Indeed.com already has a job advertisement program. Free to join and earn revenue from pay-per-click method. Create an account and 100% customized job advertisement banner in few minutes. There's a big name behind (most successful job search engine). Scam is most likely not an option.Less strict rules and regulations. 4 different types of job advertisements to show. This program is perfectly suitable for those who want to monetize their blog or website. This program is NOT SUITABLE for those who do not want to monetize blog or websites from 3rd party advertising programs. If you want to make revenue from Indeed Publisher, make sure that you have read the Terms of Service before applying for an account. Also make sure that you can add Indeed Job banner parallel to other affiliate program you have already in use. Indeed Publisher program currently provides its user to choose from 4 different monetizing options. .Details on how to set up each of them are given in point 6 below. 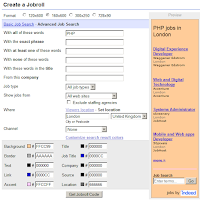 An Indeed Jobroll is 100% customized, dynamically updating list of jobs that can be placed on your blog or website. It is generated by a saved job search chosen by you, which continuously feeds matching jobs to your website. You can choose ad size from 4 different formats, 120x600, 160 x600, 300 x250 and 780 x60, all of which are convenient for viewing. You can set location for your job ads, filter for specific type of jobs and filter out jobs what you do not want to show. You can even choose which company jobs you want to show as well as customize color of your ads.Finally you copy-paste the HTML code either in HTML gadget or module available according based on your blog/site service and your Ads should appear. You can place an Indeed Job Search Box on your website so your visitors/users can search millions of Indeed jobs directly from there in one click. 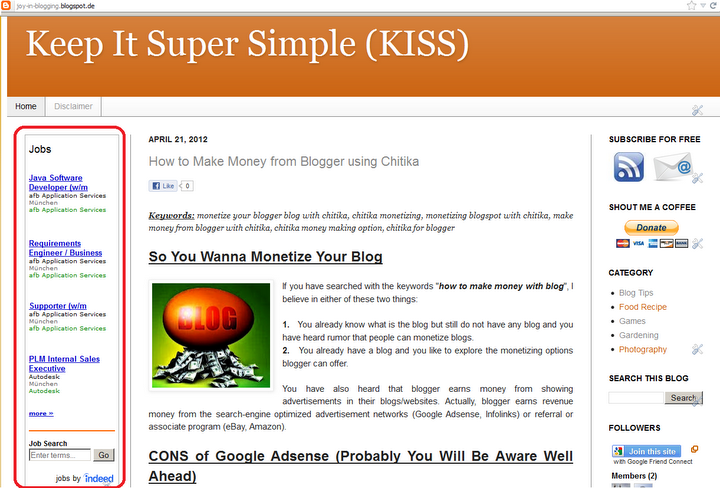 You may also add affiliate text links to your blog or website. Any Indeed job search results page can be used as affiliate links.With a job search box, user will be encouraged to search directly from your blog/site. All-in-One Format: Job title, company, keywords, location everything in one search box. Wide Format: Job title, keywords, company in one box and location in another, both boxes side by side. Narrow Format: Same as wide format except the boxes are on top of each other. Choose one of the formats and copy-paste the HTML code into your blog or website.With text links, you create HTML code for either specific job based on location/company or any type of job link and paste the code into your site. It will be appeared as text links and when user will click on it they will be taken to the site which contains your publisher ID so that you will earn revenue from their clicking. Instant Job Site is a quick-n-easy way to add a full job search experience to your blog/website. You can also earn extra money allowing your user to post jobs by setting up the price per job posting. The Indeed Web Service Search API provides an XML feed of Indeed job search results which may be integrated into your website. Using the XML output allows you to customize the way the search results are displayed. Either you go to Publisher Home and click on "Create an account" button, or, you can directly go to Create Account URL. Fill in the fields (* - mandatory fields to fill) and press the grey button which says "I have read and agree to the Terms of Service. Create my account". You have activated your account. No need to go to your email address to verify your account which sometime could take up to 24 hours to activate. Now IMPORTANT note. If you are US citizen, fill in the tax information under "My Account" Tab. Make sure under "My Account"Tab you have your contact address. That is the address where they will send the check for your earning. Once you finished your account should be looking like below for Non US account (example is given for mine). At this point, I thought to share with you screenshot of my blog where Indeed Jobroll is displayed. I have chosen default option to create the Ad banner, which means users will see job advertisements based on their location. There are several advantages of Indeed over some other affiliate programs currently in the market. Job advertisement is more appealing than random advertisements. First and foremost, people tend to click on Ads which provide information about job opportunities more than clicking on some random advertisements. Putting an Indeed Jobroll banner you will help your blog visitor to find their suitable jobs. Pay-Per-Click model. 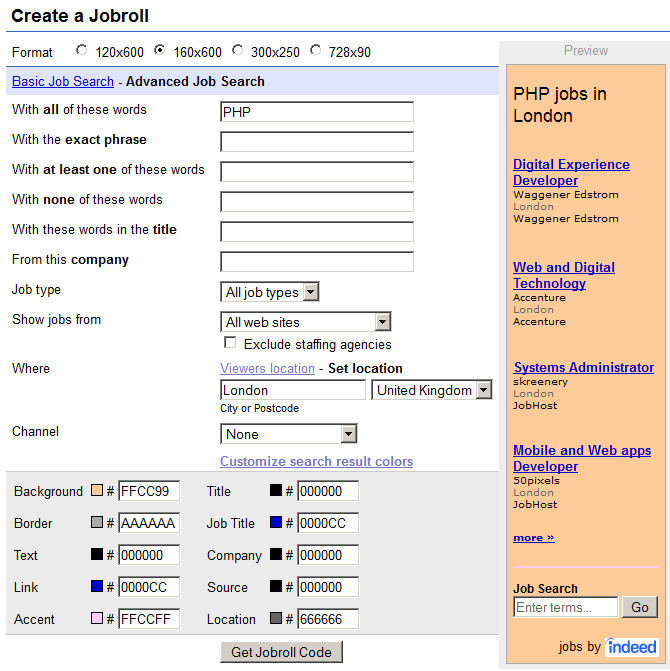 To continue on the previous point, whenever a person clicks on a job inside your custom made indeed jobroll, you will get paid. Easy to Join and Customize Ads. Indeed Publisher's rules are regulations are not strict compare to some other conventional affiliate programs. It is very easy to sign up for an account. The Ad banner for the blog/website is 100% customizable. If you are new to site or blog monetizing, you need minimum 5 to maximum 10 minutes to create account and integrate Ads in your blog/site page. There are 4 different ways to earn revenues. Free Widget for Typepad Blog users. Now Typepad bloggers can also earn revenues adding Indeed job search in their blogs. Minimum payout is quite high, which is $100 through a check. Again if the payment method is in check, for international customer it will be a bit of time consuming to reach the check to their addresses. For this my recommendation is to stay with it for a while and see if it is really working out for you. My relationship with Indeed Publisher is less than a week by the time I am posting this review. Although I have not generated any revenue at all with this, I have seen the page impression is rising. Therefore I have a good feeling that soon I will start earning revenues. This type of advertisement is more relevant to users and you will get good to your blog/site. Finally, it seems to me that type of banner, appropriate job, placement of the Ad are some of the keys to success with Indeed Publisher Program. I highly recommend that you try out this program, especially if you still have some place left to show Ads. Let me tell you one thing straight. If you want to earn money from your blog, it needs strategy and hard work, which means it also needs some time to develop a descent skill to earn from your blog. If you have any question or comment, feel free to let me know. I will be glad to hear your experience also. And if you like and find the information useful, feel free to share and "Like" it. Has Indeed paid you yet? As already mentioned, due to lower traffic I'm not getting that many of hits, but I have already made couple of bucks. So working on attracting traffic so that I will get more traffic and hit. Hello, really great job done with this review. I have a simple question, hope you dont mind. What is an averace PPC that you earn , is it at least 0.1 USD ? I don't think they tell you how much the actual PPC is. All the tell you is page views and earnings. I earned around $17 from 12,228 page views on a find job vacancies website that I have, but I have google adsense on the same site as well. To be honest the reporting isn't the best with indeed, but I'm up to $104 now from about 4 months of earnings now so I'll now see if the cheque comes to me in the UK! Ok, so you need around 700 page views to earn $1? Hi, no not in all cases. I have a job portal about how to work in London and I earned 7,19$ with only 1101 pageviews. It is absolutely up to the visitors. No, not in all case. I have a job portal about how to get work in London as well and I earned more than 5$ with about 1100 pageviews. It's up to the visitors, how many click on the job link, what is paid. I admire your enthusiasm for this lengthy review of Indeed publisher program after just a week long cooperation. However, I have used it at my very well trafficked web site, and after over 60.000 page views, I had $0 income, and 0 returned calls from their customer service. sorry if didn't work out for you very well. For me, I earned 2$ in 3 years (but I didn't do anything, no update these years on my blog) , would I be more active to provide quality content to get more traffic I am sure this affiliate program would deliver more value. However, I think it is better to incorporate it into any blog or site related to future career/jobs. Thank you as well for reading this post and leaving your feedback. Does anyone know another job board which you can integrate with your wordpress website? You have to promote your website. You can't just sit and wait for the money to come to you. Promote your content on Google+, Facebook, LinkedIn, and everywhere you think job seekers would frequent. It took a while ( about 3 months) for my sites to really take off but I'm currently making roughly $200 a month. True, Felix, thanks for your POV. I was basically too lazy and I earned 2 $ without any post all these 3 years. I think I will be more active and for sure if I produce quality content, I will attract more traffic and earn more from Indeed. @ Dobi News: Google Adsense is better than the Indeed in most of the niches. How do we get paid from indeed without ach account a paper cheque or do they send a cheque to your adress i hope anyone can tell me how it`s work. I am not there to get paid yet, but I think they have cheque options. Thanks for a very informative job post. Along with the comments it sparked the good, the bad and the ugly. Very helpful. Thanks for the valuable comment. I agree with you, that, this affiliate has positive as well as disadvantages for certain type of blogs. But it is true for any type of affiliates. What we can control is to create more valuable content to readers to get meaningful traffic which will get converted into some serious cash. It appears that none of the above has made any money with one or two comments partial. It would be helpful if we are updated about your status of affiliate relationship with Indeed. I recently implemented their program and convinced few candidates to submit their resume through the link. Though the candidates are getting good response, there is no mention of clicks, resumes added through the link. Only no. of impressions is displayed. Sent an email to Support 15 days back but no response. Wonder if they have big plans for the coming days and months as evident from their recent email to affiliates claiming to put ads on TV/Print, how can they ignore transparency. Thank you for your time reading and leaving valuable comment. I am back after 3 years and this time with my own domain name for this blog. These 3 years, I have earned only 2$, but that is because I was not actively writing atall for the visitors, readers, subscribers. So traffic was really bad. But I think to earn from Indeed you need more engagement on career/job related contents. Thanks for leaving a comment. Appreciate it very much. After 3 years, I am back with my own domain name to produce more quality content on blogging, affiliate marketing and financial freedom. I'm interested in signing up as a publisher with indeed. This subject matter was started almost 3 years ago. Has anyone made in any income from Indeed since the inception of this blog? I didn't do anything, really anything, but I got 17.98 $ over these years. At the end, it really about producing quality contents and pretty regular basis. This way you will be able to get good amount of traffic, which eventually will help you to make profit from Indeed. Sign up, and don't wait. Test it for few months if you have a site/blog already running (with completely new site/blog as it is hard to get traffic at the beginning, money will be nearly none). And if you are not happy you can always leave it behind. Can not a single user join indeed, there is company text box and website text box after confirm my email id. Indeed publisher is an affiliate program which will be displayed on a blog or website. It is for the tracking purpose as well as for their revenue system, i.e. taxation etc. If you have a blog/website, you can provide blog/website name into company tab. If you still not have any blog/website, I highly recommend you to have one, if you are serious with making money online as a passive income. Let me know if you will have any other questions. Is it ok to put website name into company text box? Tax purpose, company name or person name is required, I do not see any information about this..in faq and other indeed page. Yes, please put website/blog name (where you want to show the advertisements) in company name text box, blog/site url in next box. For payee information, use your original name and address. For tax information, select yes/no based on if you are US citizen or not. If yes, fill in IRS form. If not, you simply select no option and thats it. Save information and you are all set up. Thank you so much for this help. Very Nice Post. It is really amazing for us. Thanks a lot for sharing this . Indeed publish jobs for pvt firms, my site www.wejobs.in is a government jobs publishing blog will indeed accept my request ? Thanks for your read and comment, Karan. Yes, Indeed will accept your request to be a publisher. hello! I need some help regarding the tracking of our earnings. I am new publisher and i had few PPC and in my account section it is showing "Balance forward". What does that mean? Does it not tell us about number of clicks we had so far? I just took a quick look at indeed.com, and I saw that many of the job posted on dice.com also appear on indeed.com...so it is definitely useful. Hi, I'm from the Netherlands and I monetize a few websites with Indeed jobroll. I make about $120 a month with www.betaaldwerk.nl. I even had months of a few hunderd dollars. It's hard work. You have to create great job content and let Google pick that up. Let them send you jobseeksers to your website. I went form $45 in a year to more than thousand.